"To be continued..." Whether these words fall at the end of The Empire Strikes Back or a TV commercial flirtation between coffee-loving neighbors, true fans find them impossible to resist. Ever since the 1830s, when Charles Dickens's Pickwick Papers enticed a mass market for fiction, the serial has been a popular means of snaring avid audiences. In Consuming Pleasures jennifer Hayward establishes serial fiction as a distinct genre-one defined by the activities of its audience rather than by the formal qualities of the text. Ranging from installment novels, mysteries, and detective fiction of the 1800s to the television and movie series, comics, and advertisements of the twentieth century, serials are loosely linked by what may be called, after Wittgenstein, "family resemblances." These traits include intertwined subplots, diverse casts of characters, dramatic plot reversals, suspense, and such narrative devices as long-lost family members and evil twins. Hayward chooses four texts-Dickens's novel Our Mutual Friend (1864-65), Milton Caniff's comic strip Terry and the Pirates (1934-46), and the soap operas All My Children (1970-) and One Life to Live (1968-)-to represent the evolution of serial fiction as a genre, and to analyze the peculiar draw serials have upon their audiences. Although the serial has enjoyed great marketplace success, traditional literary and social critics have denounced its ties to mass culture, claiming it preys upon passive fans. 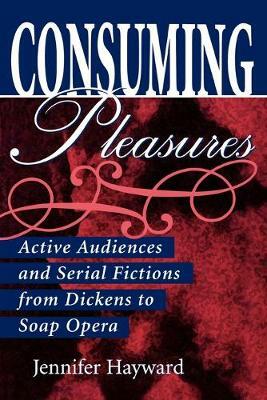 But Hayward argues that active serial audiences have developed identifiable strategies of consumption, such as collaborative reading and attempts to shape the production process.